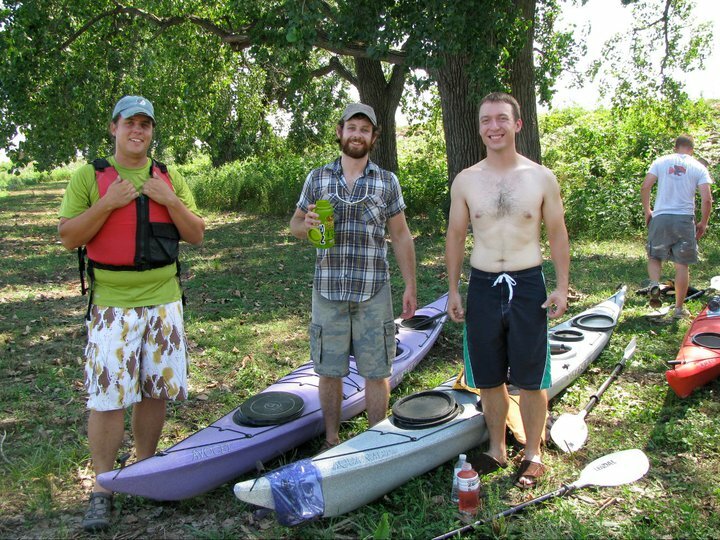 2 Great Paddling Events in Quincy! 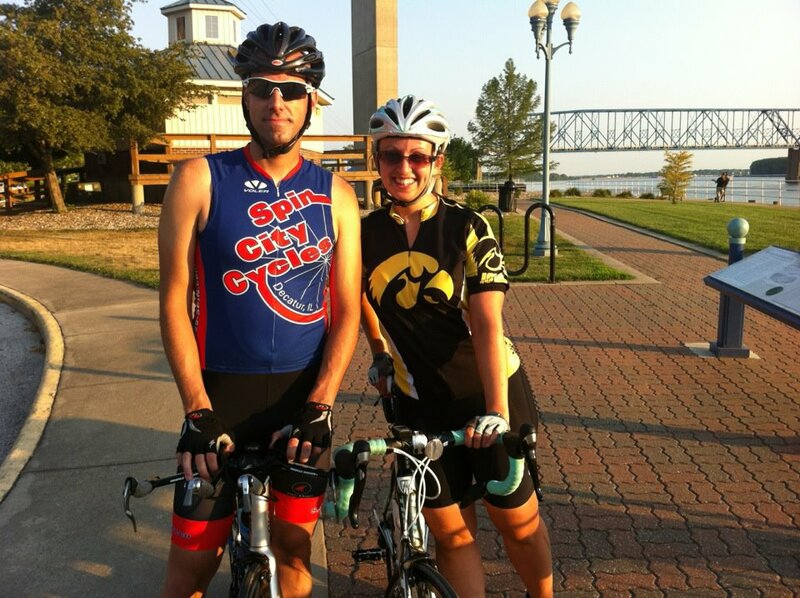 I know you’re all waiting for my RAGBRAI recap, and I promise I will get to it. It’s just tough to put a whole week into a blog! In the meantime though, I have to tell you about 2 Big Events coming to the Muddy Mississippi! It’s me– kayaking! 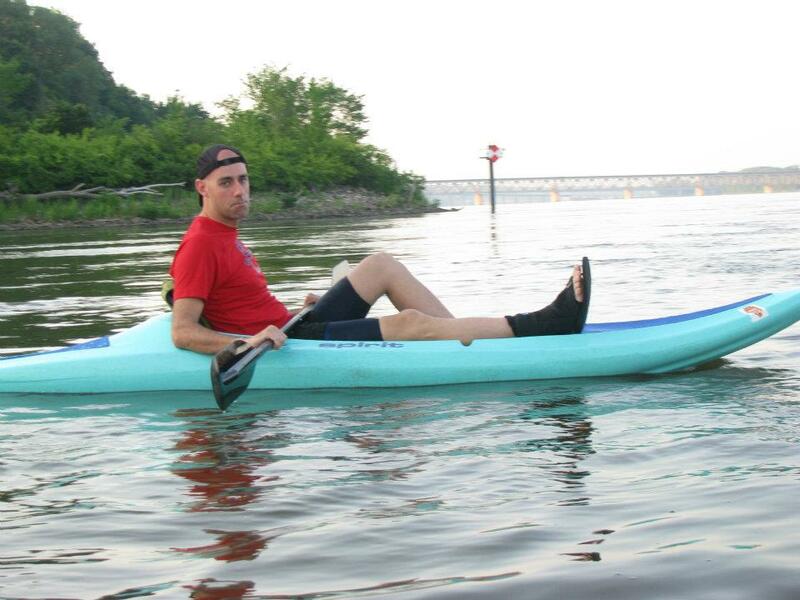 You should kayak with me. Calling all ladies! 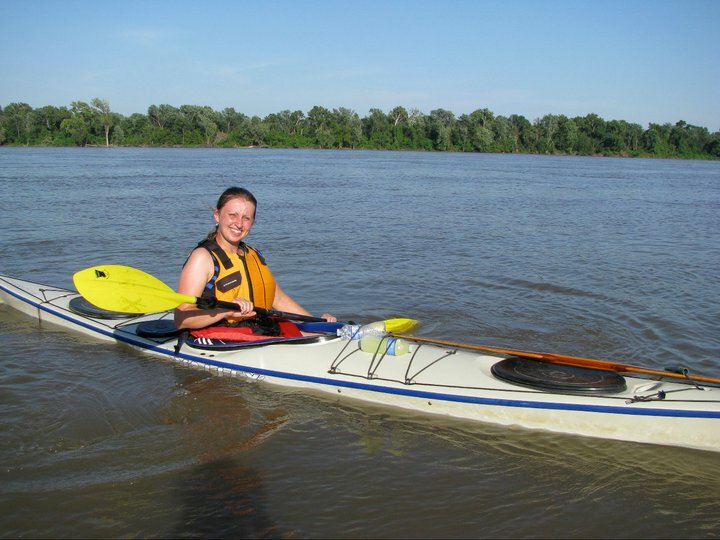 I will be leading two girls-only paddling clinics on the Quincy riverfront this month at a special reduced rate! The classes will be $25 per person and will include your boat and equipment, your life jacket, and instruction in basic kayaking. I’ll also be demonstrating kayak rescues. The classes will be held at 5:30 pm on Tuesday, August 21 and on Tuesday, August 28 both at 5:30 pm. Spaces are limited and you are required to RSVP by either contacting me on my Facebook page or emailing quincykayak@yahoo.com with your name and phone number. 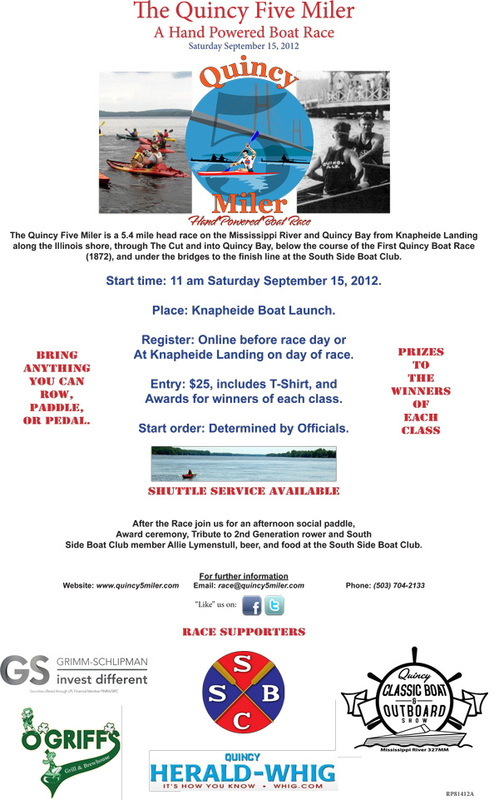 The Quincy 5-Miler Hand Powered Boat Race! The Quincy Five Miler is a 5.4 mile head race on the Mississippi River and Quincy Bay from Knapheide Landing along the Illinois shore, through The Cut and into Quincy Bay, below the course of the First Quincy Boat Race (1872), and under the bridges to the finish line at the South Side Boat Club. It will be held September 15th at 11 am. Entry fee is $25 and will include a t-shirt and prizes to winners of each division. The great thing about this race is just about anyone can enter and you stand a great chance of winning a prize. You can literally enter any river-worthy hand or foot powered boat. 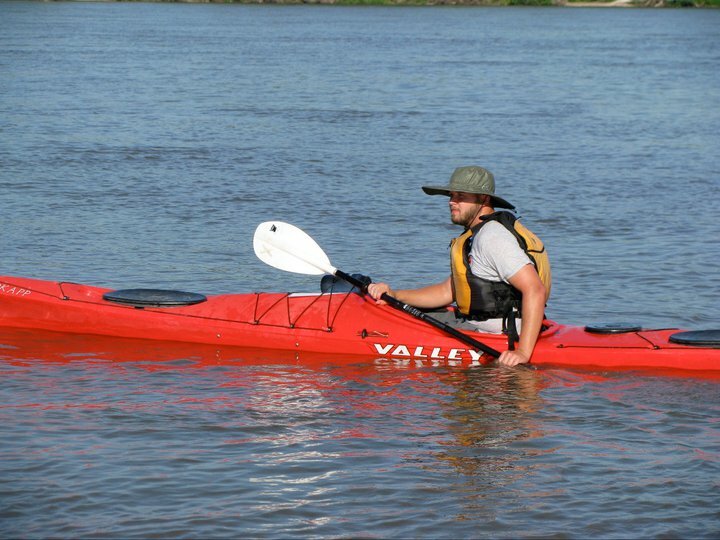 I’ll be rolling in a Valley Avocet Kayak in fire engine red! But you could show up with a canoe, a paddleboat, a stand up paddle board, a row boat, an outrigger canoe, a racing shell… heck, you can build a Huckleberry Finn style raft and grab some sticks and paddle it on down the river if you want to. The divisions will be set the day of the event based on type of craft and men’s and women’s divisions. There is a lot of history behind the race in Quincy. Once a rowing powerhouse, Quincy has a history of waterborne competition going back to the first race in 1872. The first race was a two miler (out one mile and return), put on by the newly formed Nautilus Rowing Club. The start line was on Quincy Bay 2 1/2 miles North of Maine Street. First prize for the Single Scull race was $40 in gold; second was a pair of spruce sculls. The race included singles, pairs, skiffs, and “working boats”. The “four oared” race included entries from Quincy’s Union and Nautilus rowing clubs. The South Side Boat Club was formed in 1886 and for the next seventy years Quincy provided strong crews for regional and even international competition. Aggressive recruitment included calls for the most able bodied to join the clubs and promises of expert coaching and paid expenses to races. Race boats were loaded onto train cars on Front Street and transported to Central States Amateur Rowing Association regattas throughout the Midwest. The many trophies and medals on the walls of the South Side Boat Club at 640 S. Front Street in Quincy attest to the considerable success of its crews which include numerous regional championships, a national championship in 1904, and a second (losing out on 1st place by only 2/5 second) in the World Rowing Championship of 1934 in Liege, Belgium. Quincy’s last racing eight was sold in 1950 after decline in the sport after WWII. Quincy’s recreational water interests moved to power boating and folks gradually lost sight of human powered boating as a popular activity. As Quincy Bay silted in over the years (a controversial local topic) power boat access has become more and more limited. However the shallow draft of paddle and row boats provides easy access from downtown to a wildlife-filled scenic waterway that stretches north from town along North Bottom Road. Andrew "Grizz" Ray, Ryan Welch, Justin Sievert, Clinton Begley, Laura Sievert and Ryan Craven preparing to kayak from Canton, Mo., to Quincy Bay. In my very first blog for The Local Q, I wrote, “We might not have the Rocky Mountains in our backyard, but we’ve got plenty of great ways to ‘Get Out’ and have an adventure.” When I wrote that though, I’m not sure I really believed that our area could compete with the Rockies. I thought finding things to do and topics to write about would be a very difficult task. Since then, I’ve written about running, cycling, hiking, kayaking, fishing, swimming, conservation, caving, rafting, team sports, fitness classes … it’s a pretty long list for six short months. It’s fair to say that my friends and I have had a lot of exciting exploits in a mere half of a calendar year. This Tuesday, I set out on yet another wonderful adventure with a great group of friends. 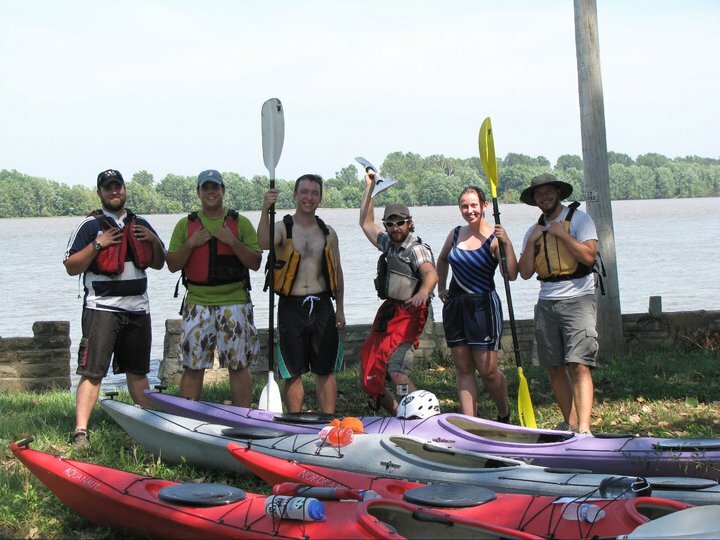 This time it was kayaking again — the seven of us braved the 102-degree heat, launched boats and paddled the Mississippi River from Canton, Mo., back to Quincy Bay. The trip was action-packed and fun for all of us. We practiced different paddling strokes, explored shore lines and surfed barge wakes. We saw jumping carp, great blue herons and at least one very surprised soft shell turtle. More experienced paddlers shared tips. We all practiced rescue techniques. I spent at least a half-hour trying to learn to roll a kayak. All in all, I couldn’t have asked for a nicer afternoon away from work. A dear friend and fellow Local Q blogger Clinton Begley joined us on this trip. Clinton has spent the last few months as a guide in the “Touch the Earth” program at Georgia State University. There, he helped guide student groups on some fantastic excursions including paddling some of the famous whitewater rivers of the South, traversing Yosemite National Park during some late-in-the-season heavy snow, and even hang gliding from mountains in Tennessee. Adventure really must be his middle name. Looking back on the fields, rivers, roads, parks and people of the past six months, I can see that what Clint said was true. This is a great area to live, and there are so many things to discover right here in the Midwest. With that in mind, I’ve decided to offer an apology, a thank you and a promise for my six-month-blog-anniversary. I apologize for spending many years in the Midwest complaining about the lack of options. Really, the intrepid and the creative can find great adventure anywhere, as long as we take the time to explore. My “Thank You” is broad, and goes out to all of the people who have facilitated, inspired and participated in my expeditions. You’re spirited friends with big hearts and bold ideas, and I appreciate you for all you’ve added to my life. And my promise: I promise not be the woman who stands near the river and says it is beautiful, nor to be the one who would dip a toe in just to say that she’s been there. I promise to dive in, get wet and, from time to time, float away. For another great blog of discovery, please read my very favorite entry from Clinton Begley by clicking here. Lt. Gov. Sheila Simon and members of Quincy Bay Area Restoration and Enhancement Association and The Quincy Tourism and Visitor’s Bureau kayaking in Quincy Bay. Most of the time when I’m in the great outdoors, the things that are absent are nearly as important as the things that are present. Absent is my iPhone and its email, instant messaging, Facebook and Internet connection. Gone, too, are the radio, the television, the junk in my mailbox and advertisements of all shapes and sizes everywhere I look. And one thing that’s not usually there — which is especially nice considering the state of things — is politics. This week though, I had the opportunity to help guide a kayak tour for the Quincy Bay Area Restoration and Enhancement Association, the Quincy Tourism and Visitor’s Bureau and a special guest, Illinois Lt. Gov. Sheila Simon. This time, I was pleased to welcome politics to my adventure. Lt. Gov. Sheila Simon and Laura Sievert kayak and discuss problems facing Quincy Bay. Simon is a stalwart advocate for the rivers, lakes and streams of Illinois. Last year, her office established the Mississippi River Coordinating Council to address specific needs of the river and its tributaries in regards to environmental protection, flood mitigation, tourism and development and commerce. The Council is also tasked with identifying sources of funding for Mississippi River resource management projects. Lt. Gov. Sheila Simon, second from left, kayaking on Quincy Bay. Quincy Bay is a unique resource on the Mississippi. Besides providing a sheltered backwater for boating traffic, the bay also has untapped potential for tourism development projects, like Kayak Quincy. It is also an ecologically diverse area that provides vital habitat for wildlife, migrating birds and more. The Bay, however, is in great need of maintenance. Silting — or the process by which sediment fills up previously navigable channels — is one of the main problems facing Quincy Bay. It’s estimated that it will cost around $6 million to dredge the bay and add four feet to its depth. This dredging is crucial to the long-term success of any management plan or development the City of Quincy hopes to have on the riverfront. I was enjoying hearing about plans to help community, state and federal organizations work together on projects like Quincy Bay when our conversation was abruptly interrupted by a large Asian Carp, which launched itself through the air and hit the lieutenant governor’s kayak with a loud thud. “And… we probably need to invest in the study and management of invasive species too?” I asked, hopefully. I don’t know what will come out of our day kayaking with the lieutenant governor. Money is tight at both the state and federal level right now, and it’s hard to say when we might see action to preserve Quincy Bay. I am heartened, however, to have met Ms. Simon. She’s clearly an outdoor enthusiast herself, and she cares deeply for the natural resources of our state. It’s important to remember that it takes passionate people to protect and develop our waterways, state parks and recreational areas, and I am encouraged that we have advocates at all levels of government that are doing their best to address problems facing these assets. Click to read more about Lt. Gov. 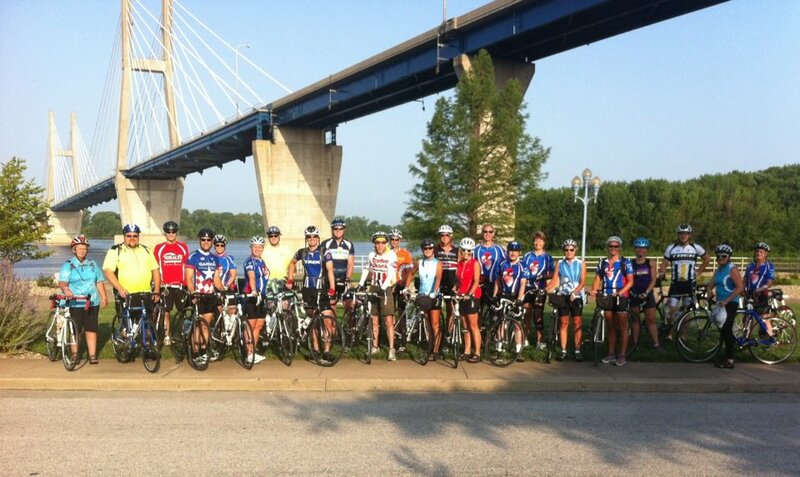 Sheila Simon and the Mississippi River Coordinating Council. 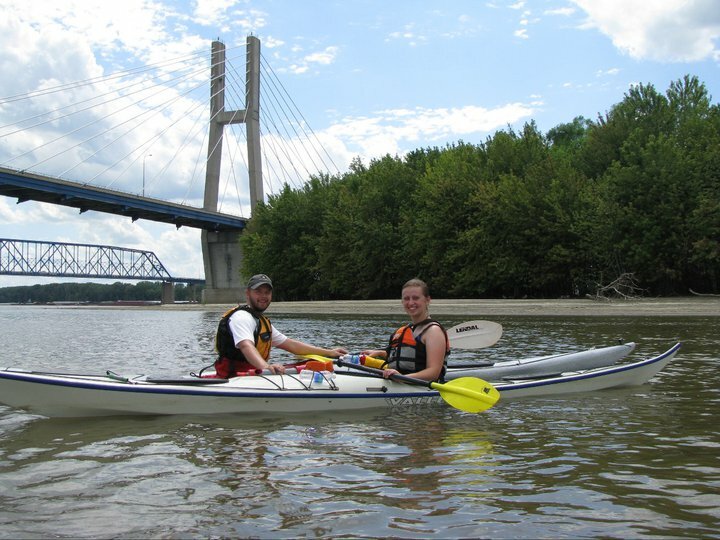 To learn more about Kayak Quincy and to book your own Kayak adventure, click here.